All right, folks, the Messiah of Pop has called upon us, and we have some work to do. The electro-pop closeted genius Ke$ha resurfaced this weekend on Twitter after a relatively quiet period of touring, recording with Alice Cooper, and "camping in the woods," which could very well be the newest euphemism for "recording the biggest sophomore album of 2012" but we don't want to get ahead of ourselves. Did ANYONE hear the Cannibal ballad "The Harold Song" on the radio yesterday, or before that? I take it from the silence that the answer is no. Of course not! Clear Channel is getting some kind of kickback to play the new Rihanna single every hour on the hour, resulting in the most enormous airplay impression gains I've ever seen, far too large to be organic (I'll be keeping an eye on that issue, because something fishy is going on there and I can see it causing drama). Who's going to waste precious weekend airtime on a year-old song by an artist who's been off the airwaves for most of the year while touring, presumably preparing her next release, and building up enough time off to juice her re-entry with "OMG new Ke$ha's!" enthusiasm that shot "We R Who We R" to #1 on the Billboard Hot 100 in its first week (Britney has a similar effect on the charts)? Ke$ha followed this tweet up with a plea asking fans to request the song, which she says is very personal to her and a favorite. 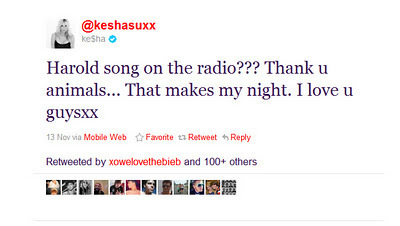 This is probably true; although it's far from my favorite in the Ke$ha pantheon, it's the best ballad she's actually published (though that isn't saying much) and it is one of the few moments Kesha Sebert peers through the glittery, trashy chic-turned-glam punk-electro club goddess costume of the great character she's played with great success since "TiK ToK" debuted over two years ago (can you believe it?). That was followed up with encouragement that "my label is listening" and some well-placed replies and retweets. Now (thanks in some part to my gung-ho participation in the game of radio airplay requests... more on that in a second) bloggers are beginning to wake up. So can social media get this dusty old Ke$ha ballad onto the radio, especially right after similarly demure songs from Britney Spears and Lady Gaga performed weaker than desired? Stay tuned. Of course, if you want to participate in the fuckery with Clear Channel and similar, using the system to your informed advantage and therefore winning in the end (plus Ke$ha would be on the radio! ), I've put up a handy little site telling you precisely how you can participate in the revolution. They say that true love hurts; well, this could almost kill me. For the record, I think "Sleazy" wuz robbed.